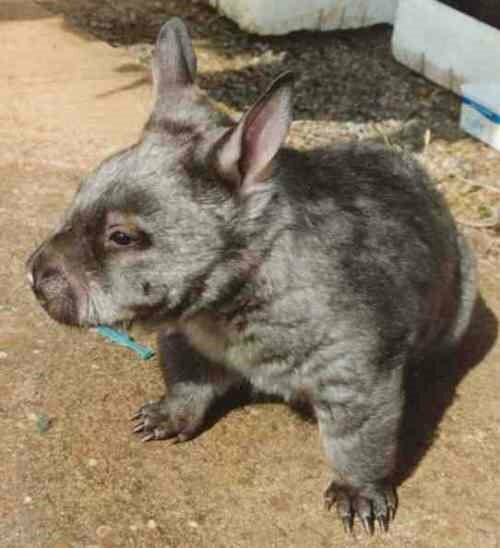 Escape From the Scooby Doo Mansion: Help save the Northern Hairy Nosed Wombat. Yeah, I know there's a lot of worthy causes out there trying to get you to donate your hard-earned shekels to them, but how many of them are trying to save the critters pictured above? That's right, none of 'em. "The northern hairy-nosed wombat is the most endangered mammal living in Queensland, as only 113 wombats live in one small protected area... Help is on the way, as a major recovery program seeks to increase the animal's numbers and to create new populations to ensure its long-term survival. The greatest threat to the northern hairy-nosed wombat's survival is the low number of wombats and the fact that all occur in one population. A major threat which has just become apparent is predation. 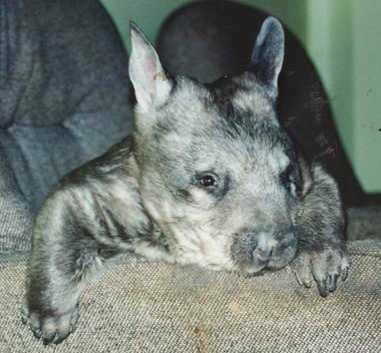 In 2000 and 2001, despite the presence of a regular baiting program, ten northern hairy-nosed wombats were killed by dingoes. This equates to nearly 10 per cent of the population! In response to this threat, QPWS built a dingo-proof fence around all wombat habitat on Epping Forest NP in 2002 to permanently protect the population. 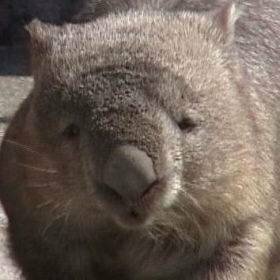 The low number of wombats has led to inbreeding which produces generally unhealthier animals. This also means a disease such as toxoplasmosis (found in cat faeces) or a natural disaster, such as a prolonged drought, could have a serious affect on the wombat population. Since 1993, the Queensland Parks and Wildlife Service has been running a major recovery program for the northern hairy-nosed wombat. This is jointly funded by the Australian and Queensland Governments with extra help from corporate sponsors and public donations. Research into the wombat's habitat includes attempts to improve the quality of food by burning, slashing and fertilising feeding areas. Long-term monitoring programs designed to find out whether changes are occurring in the type of food over time. 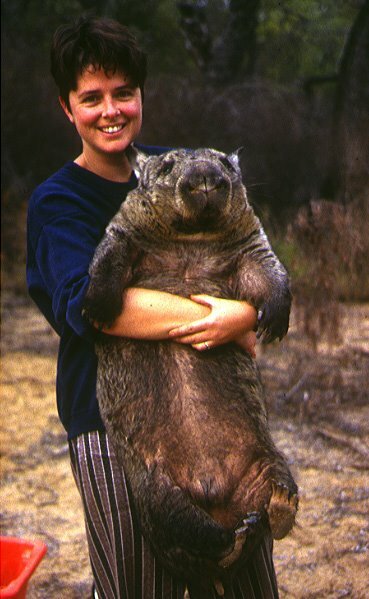 Other research projects include a study of the environment and architecture of northern hairy-nosed wombat burrows, the development of translocation techniques on southern hairy-nosed wombats to prepare for establishment of a second wild population, and reproductive studies in the wild and in captivity on closely related southern hairy-nosed wombats . One of the aims of the reproductive study is to develop techniques to cross-foster pouch young between wombat mothers. If the southern hairy-nosed wombat can be used to raise the pouch young of their own species, they could also be used to raise the pouch young of the northern-hairy nosed wombat. This would allow the northern hairy-nosed wombat mothers to breed more frequently, while their young are cared for by their southern "aunties." These northern pouch young could then be released back into the northern hairy-nosed wombat population after being reared by their foster mothers." Two things are crucial to the survival of this species. a rapid increase in the size of the population in Epping Forest National Park. the establishment of a second wild population. The Queensland Parks and Wildlife Service is searching for potential sites where a second population could be established. If you know of a suitable site with deep sandy soils, or the past distribution of the northern-hairy nosed wombat, we would be very interested to hear from you. The Queensland Parks and Wildlife Service is working hard to protect this species and to determine strategies to prevent its extinction. Respecting all wildlife in their natural habitat will ensure this endangered animal, and all other animals, get a fair go. Continuing research and management studies, captive breeding, and establishing captive and wild populations should help to ensure the animal's survival and long-term future. They're so ugly they're CUTE!!! Totally huggable. I don't see why more people aren't up in arms about their plight. Hi moncrief speaks. If you're looking for breakdancing wombats with handlebar moustaches, you've found the right blog. I used to date a wombat, but I am praying she won't reproduce offspring. Sorry tree huggers.